Get THIS GAME in your inbox! Games are better at exploring systems than any other form of art. From euro-style games about farming and power grids to The Sims, games are used to model aspects of the real world. Of course, these simulations are never perfect, in part because they must be so rigid; maps and rulesets can't capture the complexities and ambiguities of reality. 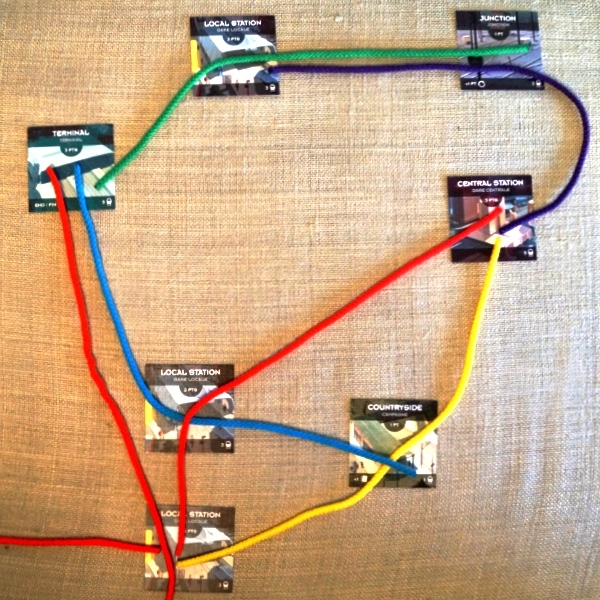 In a small but meaningful way, String Railway breaks this rigidity, taking the constraints of popular rail-building games and softening them. Gone are the hexagonal grid and fixed tracks; they're replaced by a twisting, free-form network of colorful string. The play area is one big loop of yarn, enclosing a "river" and "mountain" (a length of blue and a loop of grey). You can lay your "rails" anywhere within this randomized, abstract landscape. 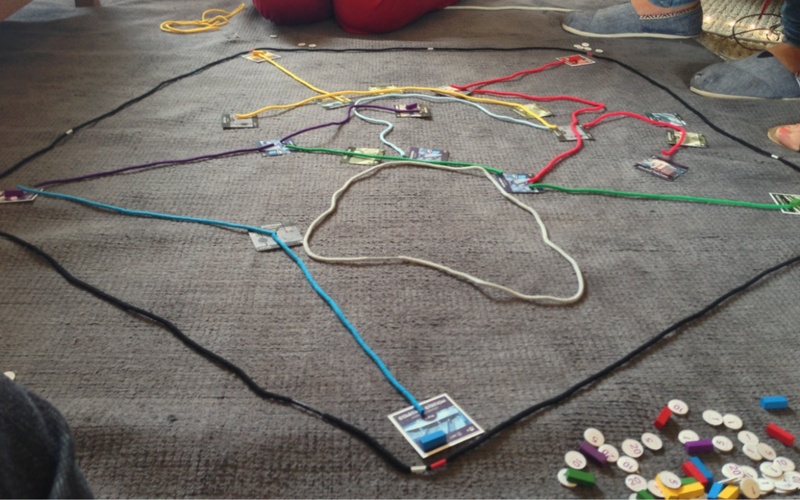 Each turn, you draw a station tile and place it anywhere within the play area, then lay down a string. Each piece extends your network, beginning from a station you already touch and continuing through one or more stations, each adding points to your score. Your railway may take any path you choose, skirting around obstacles or crossing right over them. You train lines branch out from your starting corner. In a four person game the play-field is square; with five, it makes a pentagon. If you do find yourself needing to cross another string (be it river, mountain or track) you'll have to pay a one point penalty. As a result you end up creating twisty, serpentine routes to avoid this, and placing higher point-value stations in riverbends or mountaintops to make them tough for others to reach. Play lasts only four or five turns, making this a quick, 20 minute pastime. The rules are simple enough to explain to an eight year old, but this is by no means kids-only fare; you might introduce it as a warm-up for a "serious games" night, only to find your friends wanting to play it again and again. By turning steel rails into flexible bits of yarn, String Railway transforms the genre into something more physical and strategically open ended. Breaking from the grid system is far too rare in tabletop games; there's a lot to be discovered by going off the rails. Want to hear about more games? Click here to get This Game delivered to your inbox.